One of the best additions you can add to your BMW or Mini Cooper is run flat tires, as they provide superior durability and protection. 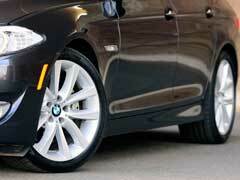 They work by allowing you to run on zero tire pressure for up to a certain mileage. This is beneficial to drivers as it allows them to continue to drive if a flat arises instead of having to change the tire immediately. As such, if you want to buy the best run flat tires, you’ll want to comparison shop. You’ll want to weigh the benefits of certain types like Bridgestone run flat tires to Dunlop run flat tires to see which brand offers you the best in value and quality. Ultimately, one of the leading brands you may want to buy is Continental run flat tires. Continental run flat tires feature some of the best technology on the market. For example, their ContiSportContact 2SSR has a contour design that enhances handling and braking. The reinforced sidewalls protects the driver in the event of a flat tire, as it will allow you to drive speeds up to 50mph for as long as 50 miles. Lastly, the bionic tread provides drivers with more responsive handling, which will create a smoother ride. However, Continental run flat tires have received poor reviews for wearing down quickly. Now it’s important to note a tire’s wear is dependent upon a wide variety of factors including condition of driving surfaces and weather. Therefore, each experience will be different, but the consensus seems to be they break down quickly. As such, it’s important to determine whether these are worth the expense. It’s also important to note that flat tire repair cost can vary depending upon each problem, so you could end up repairing or replacing these often, which can be become very expensive. Ultimately, if you are a BMW or Mini Cooper owner, you may consider buying Continental run flat tires as they can provide protection in the event of a flat tire. With that said, the common flaw among customers with these is the durability, as these wear down quickly. Therefore, it is a best bet not to buy these.